Just wanted to pop in and wish everyone a blessed and peaceful Imbolc. Traditionally a time to recognize the lengthening days and that spring is just around the corner, I love this time of year for taking walks in the brisk air, perusing seed catalogs, and resting up before the business of spring. 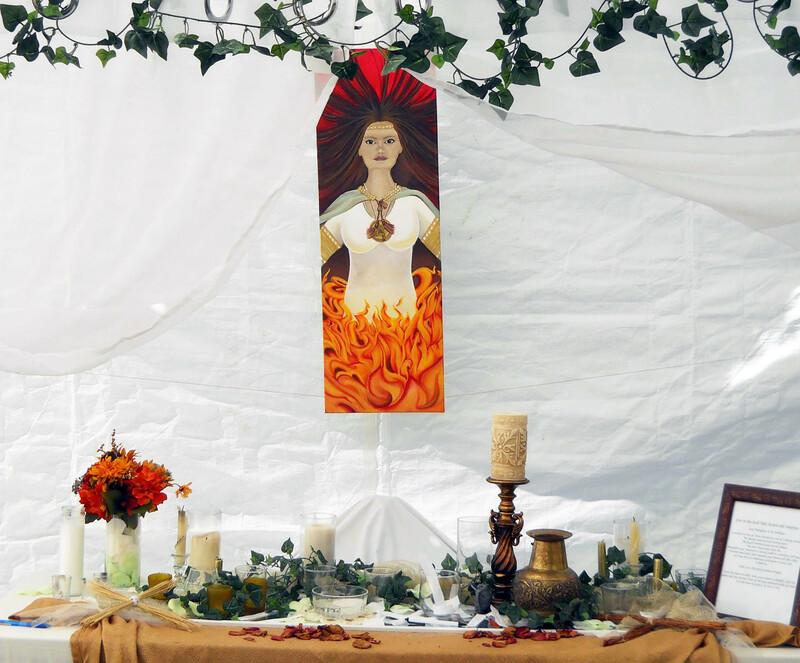 This painting of the Goddess Brigid was the feature of the temple at the Gaia Goddess Gathering in 2013. Of course, the Goddess and Saint Brigid is often the focus of this seasonal celebration, and there are so many traditional customs associated with this time: Brigid’s mantle, Brigid’s cross, attending to the hearth, milk-based dishes, shepherd’s pie, and more! Tomorrow, I’ll be gathering with my soul family to have tea, tasty treats, make Brigid’s crosses, and plan out some activities for the year. How will you be celebrating Imbolc? PS: I really am working on a whole slew of posts to revitalize this blog. Pinky swear! As I sat at home the first night of the new year, I enjoyed one of the last nights of my Yule tree. It’s a pretty little tree, and I enjoy all the different ornaments, as I’m not one for that uniform tree look. Soon, I’ll be packing away the ornaments and lights, cutting a piece of the stump to save for next year, and taking what remains to the back of the yard the birds to take shelter in. The whole way through this process, I will be grateful for having had the tree, being able to afford it, and so on. Gifts are received in gratitude. 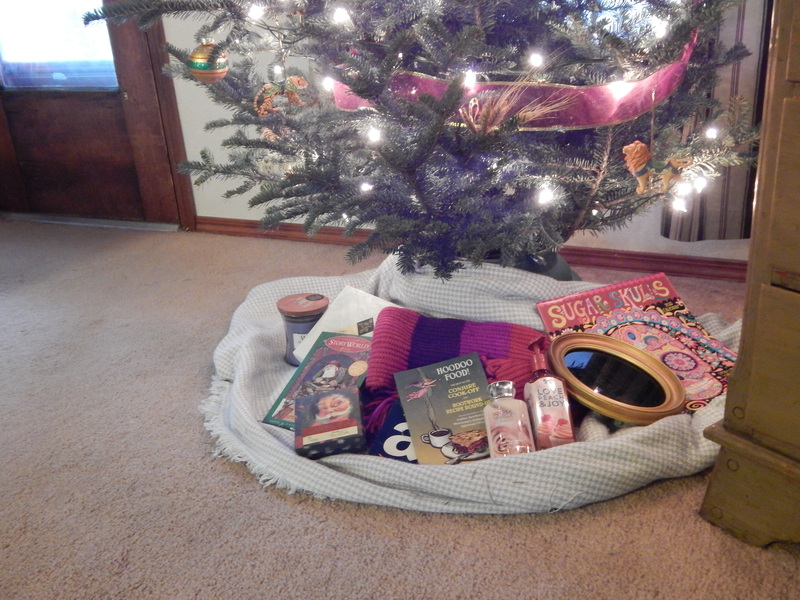 For several days after Yule and Christmas, the gifts I received from both my blood and soul family lie nestled under the tree. Though it may seem odd, I do this to take a few days to appreciate the thoughtfulness of family and friends. A few gifts couldn’t be there – there’s no way I’m putting the handmade rawhide rattle from a dear friend on the floor in a house with four dogs or the twisty cool scarf crocheted by a friend when my cat’s eyes gleam whenever she sees it – but just seeing most of these things and the loving intent behind them always makes my heart fill with gratitude. This has been especially good for me to keep in mind this holiday season. Frankly, 2014 was heartbreaking year for me. What we first thought was my Mom suffering from dementia turned out to be an undiagnosed liver disease. She was gone about two months after we knew what we were dealing with, and life for my family is forever changed – including the holidays. It would be easy to be bitter about it, and I have had my moments. But aside from the fond memories of Mom and traditions that she instilled in me, I have found myself very grateful for the family and soul friends that helped me through this year. I’ve also been focused on the idea of gratitude more recently due to working through Spirit Walking by Evelyn Rysdyk with a small study group. A book on shamanic practice, one of the first active things she has you do is a daily practice of gratitude, literally with a small offering of cornmeal, herbs, or something similar, along with a meditation. It’s a simple practice, but I’ve found it meaningful even though I’ve only done it for a few days. How often do we have days or even weeks go by without being thankful for what we have been given? And for those who like a hands-on element to their practice, this fits the bill better than just the words of a prayer. 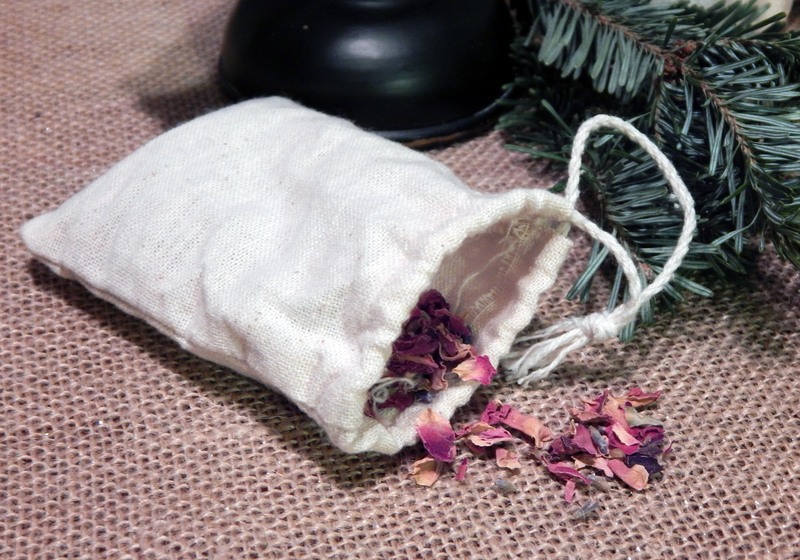 A small daily offering or rose petals and lavender buds is my physical token of gratitude. Coming off the holidays, it’s easy to see how lack of gratitude seems to play a part in the stress and problems that people have with this time of year. Gifting has gotten out of hand for a lot of families, and there’s an idea that the holiday meal should be perfect and the decorations flawless. Along the way, the idea of enjoying time together and keeping small but meaningful traditions for the holidays has been largely lost. No wonder so many people are frustrated with it all. With the start of a new year comes the obligatory list of things we intend to do (or not do) this. Lose weight, quit smoking, eat better, meditate more, spend more time with family, fix up your house, etc. – we all know the usual suspects. We also know how often we all keep these resolutions. In early January, the gym parking lot will be packed. By the end of February, the traffic has lightened considerably. Why does this happen? I’m sure there are many contributing factors, but I feel that a lack of gratitude certainly doesn’t help. Achieving a healthy lifestyle from a position of hating your body isn’t a great start. At some point, you’ll need to truly love yourself in order to see positive changes through to successful completion or into a habit. Seeing all the changes you want to make in your home without appreciating that it’s doing the basic job of sheltering and keeping you safe is losing sight of the purpose of a home. If you want to make home improvements, be grateful that you have a home to improve. Not that there’s anything wrong with improvement, but don’t lose sight of what you already have. Plant your seeds for the future from the rich soil of gratitude; otherwise, you’re trying to grow a garden in the Wasteland. Hope this post didn’t ramble too much – I have to admit a cold is making my head a little groggy. Until next time, bright blessings! PS: You can check out Evelyn Rysdyk’s blog here.